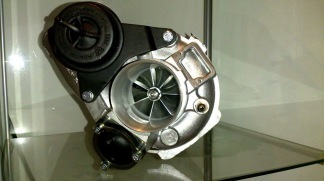 Hybrid turbo based on the Volvo K24 in S60/V70 R and S60/V70 T5 2005 and up. No junk parts used, pure Borg Warner and KKK to make the best Hybrid on the market. *Billet compressor wheel from EFR. Tested up to 510hp on E85 and 1.5 bar on OEM ME7. More at higher boost and aftermarket EMS. K24 oil and water lines in combination with the R/T5 2005 manifold will make this a bolt on to all 5-cyl, use angeled flange downpipe. RNC not included. Contact us if you have a crack free K24 turbine housing to send and the price will be lower.